2 Why should you get a JA Henckels knife set? 3 What to look for in J.A. Henckels knife set reviews? J.A. Henckels company belongs to the top players on the kitchen knife play-field and the JA Henckels knife sets belong to the top crop as well. Based in Solingen, J.A Henckels is a German company with its history reaching as far back as the beginning of the 18th century. There are very few competitors who could say they have richer history than J.A. Henckels and their Zwilling logo is one of the oldest trademarks in the whole world. 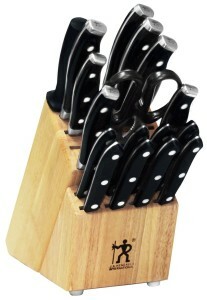 There is a wide variety of knife sets available to choose from. This fact makes it somewhat difficult to get one’s head around the wide selections and choose the best knife set to buy. If you are in such situation, you can find JA Henckels knife set reviews in this particular article. In case you are in a hurry, just scroll down the page to check the JA Henckels knife set reviews. Choose the best knife set from the following table. We’ve included some the cheapest knife sets and also some of the most expensive ones. Why should you get a JA Henckels knife set? JA Henckels is well known for high quality kitchen knives and cutlery. If that alone is not enough to make you consider the company as one of your favorites, read on. The kitchen knife sets by the company vary in numerous aspects. One of the most basic and for many people most important aspect is the price. Yes, JA Henckels do make entry level knife sets just like any other company. The question is whether they are worth the money or whether you should spend more money to get better price-performance ratio. J.A. Henckels knife block sets come in two major lines – the J.A Henckels International line and the J.A. Henckels Twin line (aka Zwilling line). Now what’s the difference between the two lines apart from the price? JA Henckels International – the Henckels International knife sets are the entry level to mid range sets made by the company. By many they are considered to be inferior to the higher level Twin sets, however that’s not always true as we will discuss later on. The International block knife sets can be recognized by the logo which only shows one human figure, whereas the Twin line shows a twin figure (how surprising!). Most of the knives from these sets are stamped knives, which again, is often associated with lower quality. Again, that’s not entirely true. What really is true, is the fact that they are made of slightly lower quality steel which will not hold edge for as long as the Twin lines’s steel. JA Henckels Twin – this is the top of the crop line made by the company. The knives are made of higher quality high carbon steel which will hold it’s razor sharpness for long periods of time. This steel however requires better care than the lower end steel. Forget about leaving the knives in the dishwasher. Another fact that is often considered as the deal-setter is that the knives are usually forged. What to look for in J.A. Henckels knife set reviews? If you are going through online reviews or my own reviews of the Henckels knives, make sure you evaluate the following features and attributes of the knives. Sharpness – Every knife should be as sharp as possible to perform all tasks required of it effectively. Most importantly, a dull knife makes the cutting, slicing, and dicing process more difficult, but also more dangerous to the person performing the task due to unwanted slippage. Therefore choose such knives that are razor sharp and hold the edge for long time. In case the knives don’t hold edge well, be prepared to sharpen them frequently. Grip – The blade and handle of the knife should be balanced, and designed in such way to allow it to be used almost as a hand extension. Holding the knife in one’s palm should be comfortable and provide firm grip, which in turn prevents the knife from slipping from the hand. Blade type – In the recent years, mass production and price wars have caused the industry to look for cheaper ways to craft blades. What they came up with were stamped or laser cut blades which are cheaper than traditional forged blades. On the other hand, most people see them as lower quality blades. They are usually thinner and made of slightly lower quality steel. Number and type of knives in the set – Depending on the needs, you will have to choose a knife set which will cover all or at least the most of the needs. A typical JA Henckels knife set will feature a chef’s knife, a bread knife, a boning knife, a peeler knife and a utility knife. This is the basic list though and most sets will include many other knives and tool such as santoku knives, shears, or sharpening iron. This is one area where no one can help you, as you are the one who will be using the knives and you have to know beforehand what types of knives you need. In this part, we will take a look at some of the best JA Henckels knife sets available for purchase. The list of the products in question has been compiled based of JA Henckels knife set reviews by verified customers and my experience. Hopefully you will find the set that will suit your needs. Zwilling J.A. 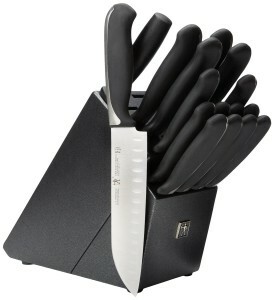 Henckels Twin Pro S 7-Piece Knife Set comes with an elegant hardwood block to place your knives in. 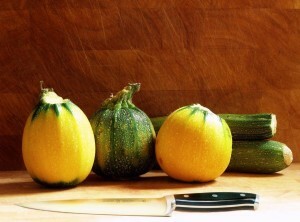 The four knives have different cutting skills and therefore satisfy different cutting requirements of the customer. Together, they make the perfect knife set for a professional as well as a household kitchen and sum up all your slicing, dicing and chopping needs. The four knives are a chef knife, a santoku knife, a utility knife and a paring knife. When you have this knife set at home, there is nothing to worry about. You would enjoy cooking as the most tedious task of cutting will be taken care by this fantastic knife set. This knife set is also accompanied by sharpening steel which keeps the edges of the blades intact. Moreover, a pair of kitchen shears is also provided for trimming flowers, herbs or strings etc. The hardwood block beautifully holds all seven items and turns out to be quite a masterpiece for your kitchen. Due to the presence of the three rivets classic handle, this knife set stands out among other quality knives. This handle provides good comfort and helps to make smooth cutting moves. You do not have to make too many movements or put too much pressure for cutting. Cutting becomes extremely easy when you have the Twin Pro S Henckels Knife Set. 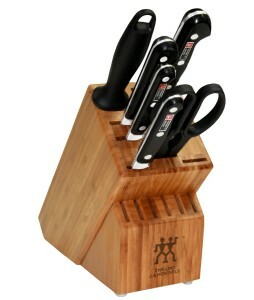 The knife set enjoys overwhelmingly positive reviews from customers. Click here to buy this knife set on Amazon! If the previous knife set was too expensive for your budget, I’ve got another Henckels set for you, and it contains even more knives. This time however, the set is not a part of the Twin line, instead, it belong to the International line. Design-wise, I would say that the set looks even better than the more expensive one. What I really like, is the black color of the hardwood block which goes along nicely with the comfortable full tang, santoprene enhanced, handles. With its average customer rating, the set is clearly nowhere near the rating of the previous Twin line knife set. However, you should not be expecting this 17 piece set to be as good as a half a grand 11 piece set. You will pay only couple bucks per knife, and unfortunately you cannot expect top notch quality for that. On the other hand the set will still be better than most of other sets by less known brands. For the third recommendation, I’ve chosen something in the middle of the price range between the two previous reviewed JA Henckels sets. There are two versions to choose from – depending on your preference, you may get an 18 piece set with 8 steak knives or a 10 piece without the steak knives. I have to say that the steak knives are great, but the price of the set goes up steeply with them included. Compared to the previous set, I really like the riveted full tang handle. It’s very comfortable to hold the knives in palm, and they don’t tend to slip while cutting and slicing. A nice touch to the handle is the metal cap with Henckels logo. The blades are made of stainless steel with satin finish, which makes them look more expensive than they truly are. None of the important knife types are missing here. I love that Henckels add Santoku knives to their sets. It’s really a nice alternative for classic western chef’s knife, and Heckels have crafted some of the best santoku knives. As the rest of the International line, these knives are not actually made in Germany, instead they are made in Asia. Namely in China and Thailand, so if you are one of those people who hate Made in China stamp, do not get this set. For those who don’t mind that, this set is among the best JA Henckels International knife sets you can get. Unlike the previous product, the Forged Premio set receives generally very positive reviews. That is truly a remarkable for such low priced product. The time to close this long article dedicated to JA Henckels knife set review has come to an end. Hopefully you have chosen the best knife set for your needs and I am looking forward to see you on my website again. This particular article will get updated from time to time when some new sets are released.